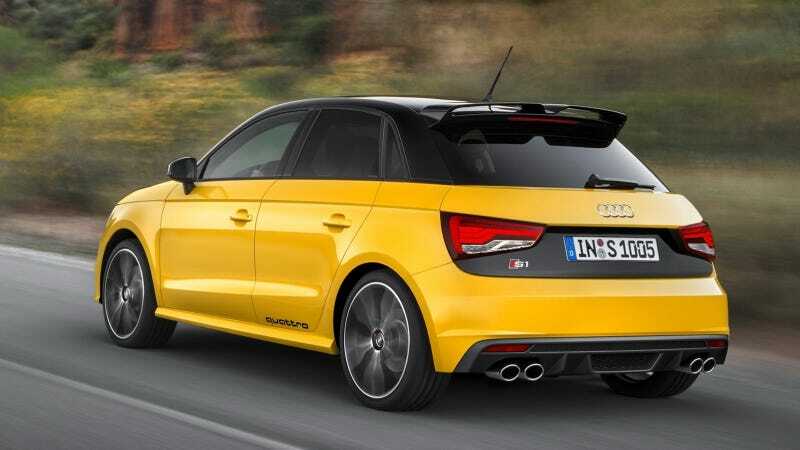 The mystery car Audi teased us with last week has been revealed in all its glory, and it is the 2015 Audi S1 Quattro. It looks psychotic and cute at the same time! The full car should make its debut soon at the Geneva Motor Show, but the world seems to think it will be powered by a 2.0-liter turbocharged four with something like 220 to 250 horsepower, quattro all-wheel drive, and a six-speed manual. Clearly from these photos it's based on the A1 Sportback, which is the five-door version of the A1. No word yet on a three-door version. I'm digging the black-and-yellow two-tone paint, the huge quad exhausts, that crazy roof spoiler, and the fact that it has a clutch and a stick as the Quattro Gods intended. I know we Americans don't get the A1, but I bet at least a few of us would give this one a try.